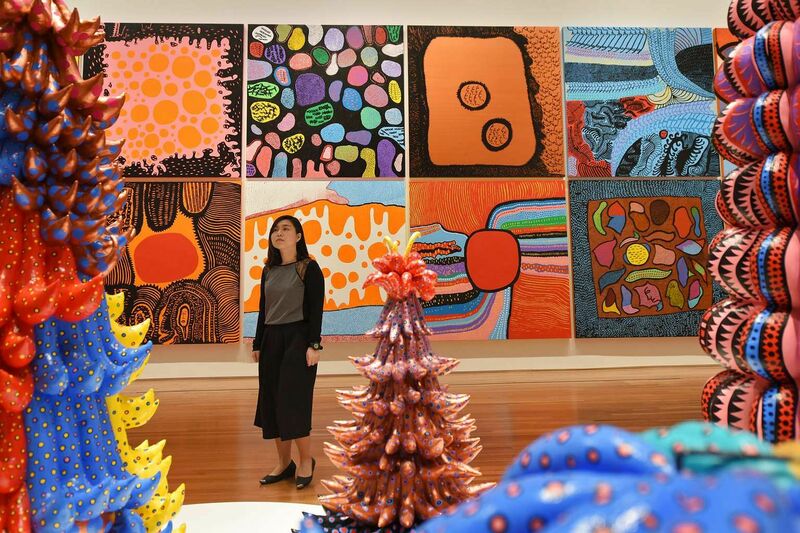 Yayoi Kusama, the grand dame of Japanese avant garde, will hold her first major museum exhibition in South-east Asia at the National Gallery Singapore from June 9. Visitors to the exhibition Yayoi Kusama: Life Is The Heart Of A Rainbow, opening on Friday at the National Gallery Singapore, will be the first in the world to see new soft sculptures and paintings from her ongoing My Eternal Soul series. The new pieces that are fresh out of Kusama's studio in Tokyo include the exhibition's titular painting, a burst of bright colours marked by dots and lines. In addition, there is the mirrored peep room I Want To Love On The Festival Night that was specially created for the gallery. The installation is a recreation of one of her earlier mirrored rooms, Endless Love Show, but features three holes at different heights for visitors to peer through. Viewers will be transported to an infinite cosmic world of blinking colours created by numerous light bulbs and mirrored sides. Fans of Kusama, considered the grand dame of Japanese avant-garde art, will get to view her expansive oeuvre spanning seven decades at the showcase. It will run until Sept 3 at the National Gallery's Singtel Special Exhibition Gallery and City Hall Chamber on level 3. This will be the 88-year-old's first major museum exhibition in South-east Asia, with more than 120 of her artworks - comprising paintings, sculptures, videos and installations - from the 1950s to the present. Although the red-wigged octogenarian was unable to be present during the media preview yesterday, she tells The Straits Times via e-mail that it is her "greatest wish that the people in Singapore will love them". She adds: "Over the years of dedication and struggling, I have aged, but I am willing to continue this path and do my best to create art to leave the message of 'love forever' to the young generations." Visitors to the exhibition can expect her signature splash of polka dots, mesmerising infinity mirror rooms and pumpkin sculptures. Entry will cost $15 for Singaporeans and permanent residents and $25 for non-Singaporeans. Timed entry tickets will be issued to prevent overcrowding and advance online booking is encouraged. Mr Russell Storer, the gallery's deputy director, curatorial and collections, says the exhibition is intended as an introduction to Kusama's works. "We chose works that reflect all the key phases in her career, show the diversity of her work across all mediums... and, really, the sense of creative drive that come through in her works," he says. He co-curated the exhibition alongside the gallery's curator Adele Tan and Reuben Keehan of Queensland Art Gallery and Gallery of Modern Art (QAGOMA). The exhibition is a collaboration between National Gallery Singapore and QAGOMA. It will travel to the museum in Brisbane after its showing here. The showcase, which takes up close to 2,000 sq m, is divided into three sections. Visitors will be greeted by Kusama's signature motifs of dots, nets and pumpkins, followed by works that engage with the human body. The last section features two of her recent series: Love Forever and My Eternal Soul. The latter particularly "represents a culmination of her work as an artist", says Mr Storer. "It captures most of the key motifs that she had used throughout her life... and also new imagery such as jagged forms and new metallic paint." The bright and colourful series is still a work-in-progress. Kusama initially intended to complete 100 paintings, but has created more than 500 so far. Ms Tan adds that the exhibition shows works that are less frequently displayed, including three works from the series Cage, Painting, Women (1967-1970). The three "caged" paintings with a layer of wire netting over the canvas show Elizabeth Taylor, Mata Hari and Marilyn Monroe - famous women Kusama regarded as "bad girls". The showcase culminates in one of the artist's large-scale installations, Narcissus Garden, a sea of 1,500 reflective stainless-steel balls displayed in the City Hall Chamber. 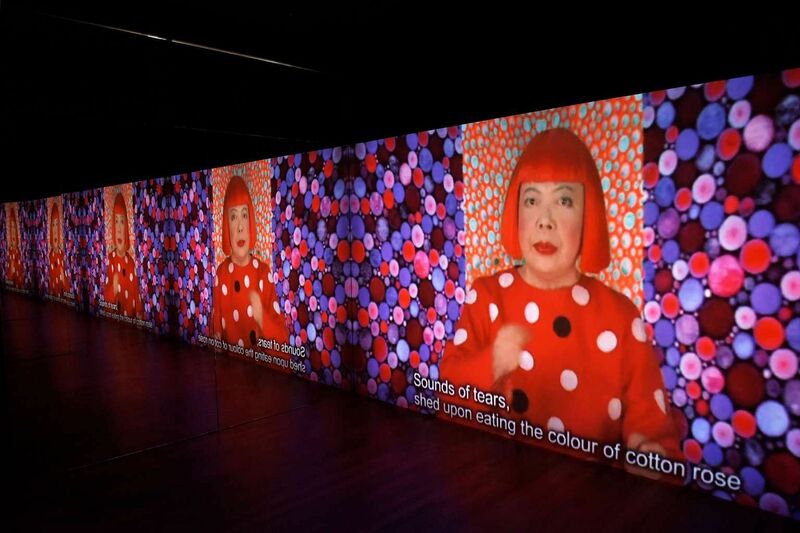 Kusama is one of the world's most popular and influential artists. Her recent exhibition at the Hirshhorn Museum and Sculpture Garden in Washington, DC, attracted a record 160,000 visitors and was the most popular showcase in the museum's history. "It is overwhelming and my heart is filled with joy. I cannot be happier learning that many people sympathise with my art," she says.